This book disappointed me greatly. The author did convince me he was an expert at the type of target costing performed by Toyota, but did not succeed in explaining a coherent management theory based upon it. An attempt to explain too much and a tendency to ramble and sometimes to rant defeated the book’s potential to help people understand and apply the method. The publisher didn’t do the author or the reader any favors. The developmental editor’s job was to critically appraise the book from the reader’s perspective and help the author craft a vehicle to convey usable and valuable knowledge clearly and logically, however, it needed a thorough reorganization. It also needed more competent copyediting and book layout. Publishing the book in its current state was like manufacturing an automobile full of design defects. As Jim Rains says, few North American companies use real target cost management (even when they talk about "target costing"), yet it's a critical tool in many admired Japanese firms, those we’d consider “lean.” The reasons for its neglect won’t surprise you: it is detailed, it takes deep experience, and it takes a long time to build up. Rains is the right source for this guidance on improving profitability. He has studied long and hard with the best in the world, and has helped companies move along the path. Early in his discovery of how Japanese firms manage costs, he tried to bring the knowledge into GM, which had immunity to it. The concept of target costing The book reveals the importance of a structured cost management approach in the earliest stages of product design. In the best companies, this is a given. In most companies, however, designers and engineers are not expected to think about cost. Manufacturing gets judged for managing costs that are largely frozen into the products they are expected to make. price - profit = target cost. Traditional companies think profit is what’s left over after price and cost vary, so profit can vary wildly. If you reduce your price to drive lagging sales, profit will be lower. If you badger suppliers into reducing cost, profit goes up -- maybe. Admired companies set price based on what a customer will pay for the perceived value delivered, then it sets profit targets based on what will support growth and return on investment. That determines what cost must be, and design and engineering have to achieve that. Rains argues that target cost management is less about managing the costs, and more about managing the company by thoroughly understanding cost, enabling the company make the right strategic choices to achieve price points and ensure profitability. The company must understand that the task will require a lot of work to develop the knowledge and data it will need to help product design manage costs effectively. The secret weapon is the cost table. Cost tables go into great detail about what to expect for the cost of every material, every process right down to boring a hole in a piece of metal of a certain size with certain machining properties, every bit of scrap, and every minute of labor. The tables are modularized and parameterized for reuse. The people who maintain the tables must know their stuff, continue to learn, and continue to improve the value of the cost tables, which become knowledge assets of the company. If you performed a value analysis for the reader, this core information is what should have been organized and explained. That would take about 100-125 pages of this 200-page book. The first 60 pages are, to my mind, largely waste. The author digresses about what’s wrong with the way manufacturers look at costs. Anyone who has gotten interested in target costing has probably already heard all that. The author had a structure in mind -- the ladder -- for how to approach target cost management. Models are nice, but in this case, he seemed to get married to the model -- and the publisher let him -- and it got in the way of the core concepts of the book. It would be enough to say that unless certain practices like lean manufacturing, value analysis, six sigma, and a bunch of three- and four-letter acronyms are in place, the company isn't fully ready for target cost analysis. Using 60 of 200 pages for superficial descriptions of the tools before getting to target costing itself puts up a barrier for the reader. The next 50 pages set the stage for getting started with target costing and setting up the organization. With more judicious editing, this could have been done in perhaps 30 pages. The real value of the book is delivered in the next 40 pages. The real core concepts are well explained. Good diagrams examples help develop the idea. Next is a 15-page chapter on a company called Alpha Brain that built software for target costing, before succumbing to the dot-com meltdown. Jim Rains shares its story with an extremely valuable, complete with screen shots, of how a machined part could be costed effectively. I would have liked to see this made part of the explanation of target costing, not set off by itself. Finally, we have 20 pages of accounts of how several Japanese companies have used target costing in their management processes. The cases have varied levels of usefulness for the reader. Several are more than 10 years old. Some are more detailed than others. They shed light on what target cost management can do, but it would have been better to have integrated them into the flow of discussion rather than to set them off as a separate chapter. Besides the lack of developmental editing, the book was flawed by poor execution of fundamental publishing production processes. The book design muddied the presentation. In the "ladder" diagram, the illustrator placed the words loosely around the rungs, making it difficult to tell at a glance which rung a concept belonged to. Then when a rung was illustrated within a section, there was not enough space around the "Figure" to set it off. That made it looked like a formula placed within the text of a math book, but it wasn’t in the proper place in the flow of the text. Let me not belabor the point. Unless you look, it's hard to understand what I'm describing. Still, it was an example of thoughtless book design and the editor should have demanded a change. The copyediting shows me more evidence of the publisher doing the job on the cheap. There are mistakes that make me wince. If the editorial staff had the proper style sheet process, "takt" would not appear as "tact," nor would Aisin Seiki be spelled "Aisen" Seiki throughout the book. That a publisher of so many books about Toyota and lean could let that happen is nothing less than embarrassing. Publishing is costly, not for the printing, paper and ink, but for the human knowledge applied to the ideas the reader wants to find. Most writers of manufacturing books come from manufacturing, and shouldn’t be expected to be authors. The publisher must provide the resources to shape the book and help the reader find the core message, accurately. The lowest-cost editor doesn’t have enough subject matter knowledge. The process may be collapsed into too few review cycles in a wrongheaded pursuit of “lean” or just by cost-cutting mandate. The publisher should be willing to spend a few thousand dollars more for subject matter reviewers who will criticize the work in detail and editors who know the scope of what lean means. I don’t see evidence of that in this book. Pay $50-60 for this book if you are willing to accept that only about half of it is useful. But if you compare that price to the value of improving your company’s cost management or your own capability to understand it, the expense is trivial. I checked Amazon for other books on the subject of target costing to see if there is a better choice. There were a few, including one by our old friend Yasuhiro Monden, but no useful reader reviews. Not having seen any of them, I can’t help you there. You may also want to look at books on value analysis/value engineering (VA/VE), which is a foundation of target costing. 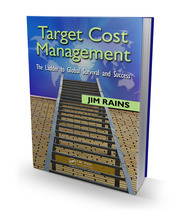 Target cost management is a subject that lean thinkers should study, but haven’t. Maybe as lean penetrates into product design and supply chain planning, the interest will grow. When that happens, I’d like to see Jim Rains get the chance to share his knowledge in a better book. Hey..this is great and the formula for the target profit that you suggested is also great. THis is the best way to know the target cost. The management is all about managing things whether it is cost or the quality or the productivity. Great post Karen, and timely too! I'm in the middle of analysis of our pricing right now. I have some people I will be pointing to this post.